Hebron Christian Fellowship is a Bible-believing assembly located in Bolivar, Missouri. We are a group of ordinary people, bought by the Blood of Jesus Christ, and united in our desire to forsake everything and follow Him (Luke 14:33). In being committed to our Lord, we are also committed to one another: to worship together and exhort one another (Heb. 10:25), to confess our faults and pray for each other (Jas. 5:16), and to walk together as the Lord leads us in sanctification and service (1 John 1:7). After many years as a home-based fellowship, Hebron expanded in 2017 to reach out more broadly through a public venue. Our vision is for the assembly to continue to function like a family, where the members know and are known by one another. We are non-denominational, not because we are opposed to denominations, but because we feel our calling is to connect with believers from a wide variety of backgrounds. We are passionate about doctrine, but also strive to avoid division over non-essentials. For more information on our beliefs, please see our statement of faith. Our Sunday morning services begin at 10:30, and generally run 1-½ to 2 hours. We open with a time of worship, which is acoustic in style, featuring a mix of familiar contemporary worship songs, and both old and modern hymns. We give opportunity for members to share prayer burdens and praises, before moving into a time of corporate prayer. One of our teachers will then bring an expository message from the Word, using the New King James Version of the Bible. We aspire to have decency and order in our meetings (1 Cor. 14:39-40), but also to be Spirit-led, which means that any agenda we might set is always subject to change. Family-integrated means that we desire to minister to whole families, and all ages are welcome in our services. There is also a small separate room where children can play or draw during the service at parents' discretion. Join us at 10:30 Sunday mornings at The Freedom Building - 892 W Hwy 32 in Bolivar. 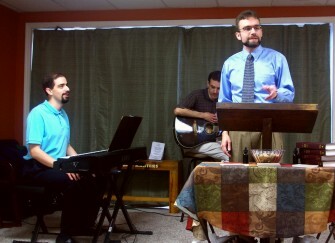 Our format includes acoustic worship music, prayer, sharing, and sound Bible teaching. Contact us with any questions.